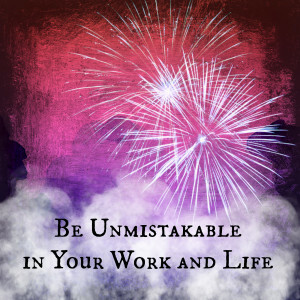 What will you do in 2016 to assure you and your best work are unmistakable? This is the last prompt from Quest 2016. And it is a great one for me. I am unmistakable. I know this. I have always been one of those people who makes an impression. I do not blend easily into the background. I do not have to “do” anything to be unmistakable. I just need to show up. My work, on the other hand, is entirely forgettable and mistakable far too often. What would it mean for my work to be unmistakable? Unmistakable is not unforgettable; it is not irreplaceable. Calling for my work to be unmistakable is not setting standards about what return I will get from my work. Being unmistakable simply means being clearly one thing as opposed to any other thing. For my work to be unmistakable is merely to create things that are identifiable are my work as opposed to somebody else’s work. And, to assure that my work is unmistakable, I must let the specifics of my experience and perspective appear in my work. Individuality is in the details. We are all human beings with human needs, desires, and experiences, but what makes each person unmistakable are the details. I have identical twin nieces. I make mistakes in identifying them in pictures or when I walk into a room where they are sitting quietly. But, as soon as they speak or act, the differences between them become clear. Despite having identical DNA, living in the same house with the same parents, and having many of the same experiences in life and through school, they are unique people with unique perspectives on the world. And when I see more than the external similarity between them, which is extreme, they are unmistakable. It is so much easier for my work to be unmistakable than for my nieces to be unmistakable. I have a highly unusual set of educational experiences, a breadth of experience with different English-speaking cultures, a remarkable comfort with skepticism and wonder, a huge body of literature, art, philosophy and culture that I have been exposed to, and a set of aesthetic pleasures that are particularly free from the boundaries of genre and media. If I bring the breadth of the details that inform my work into my work, my work cannot be anything but unmistakable. What is Holding Me Back From Being Unmistakable in My Work? My insistence on inter-disciplinary, cross-genre, boundary-breaking living and thinking has a history of making waves. I can hold more complexity in my mind than many people. In all the places in my life where I join in communities with a single focus, there have been people who were uncomfortable with my complexity. In my formative years, the world around me seemed to call me weird like it was a bad thing. I carry in my body deep fear that if I let my weirdness out, I will be alone and unloveable. Despite evidence that my weirdness is what draws my favourite people to me, I hesitate to let that translate into my professional work. The bulk of my professional life has been in the conservative, corporate legal world. Despite working with cutting-edge technologies and innovative businesses in Silicon Valley, the law office I worked for was part of a major, old-school, New York law firm. My office was the odd-balls who were tolerated because we brought in too much money to ignore. But, even in that office, I was the oddity, the artist who needed a creative life of my own, who wasn’t satisfied simply facilitating other people’s creative work. I struggled to balance the needs of my soul with the needs of the office, whereas my colleagues met the needs of their souls through the work or sacrificed their needs to the needs of the office. Later, as a fundraiser for a theatre company, I was part of the corporate face of the institution, the respectable side of things, not the passionate, creative side. Finding ways to be a creative, passionate, effective business artist is calling on me to reject the rituals of business that I have experienced and find new models. And to trust that there is a way to be authentically me and professional at the same time. It seems too much to believe that, in fact, the way to business success may be to be the weirdness that is me. The fear of being unloveable and unrewarded is great. And, I know from experience, that I cannot conquer the fear. I can only set it aside and work despite the fear and see what happens. And to trust that even if I discover that working that way does make me unloveable to some people, a) I will be able to handle it, and b) it will also make me compelling to others. In addition to my fear of being unloveable, there is an arrogance to thinking of myself as special that I reject. But, in retrospect, I have thrown the baby out with the bathwater and also rejected the idea of allowing my unique qualities to drive how I present my work. There is a crucial distinction between being unique and being special. Each human being is a unique constellation of genetic tendencies and lived experiences. This does not make us special in any sense of being deserving of more or better. It makes us special only in the sense of being different from every other person. It is possible to both honour my uniqueness and to remain humble. All I need to do is show up fully and get my ego out of my way. If I let myself show in and through my work, it will be unmistakably work that only I can produce. Srinivas Rao is the host and founder of The Unmistakable Creative podcast where he has conducted over 500 interviews with thought leaders and people from all walks of life.